Please use the browser which supports iFrame. If the page does not load, click here. Conntry Joe is a calm mountain cottage style lodge with a cozy atmosphere. The lodege, commandig a view of Northern Alps and standing in front of the ski slope,welcomes all guests with delicous meals and heartful service. We look forward to serving you all. For those who are traveling freely and have meals on their own. Included breakfast. Enjoy Hakuba’s local food. A standard plan included dinner and breakfast. ※you can buy a lift ticket at a discounted price. Weekday fee will be applied on Saturday and consecutive holidays from March 22. For more detail, please check the “Plan and Price” page. Country Joe welcomes single guests. Please inquire for discounts for large group. More ways to enjoy Tsugaike, like on snowshoes. Our guests at Country Joe. The details are this place. 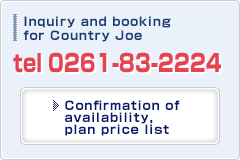 Country Joe looks forward to welcoming all guests. Copyright(C)2012 COUNTRY-Joe All Rights Reserved.